The RJD leader was referring to the remark the Bihar CM made at an event on 26 May. 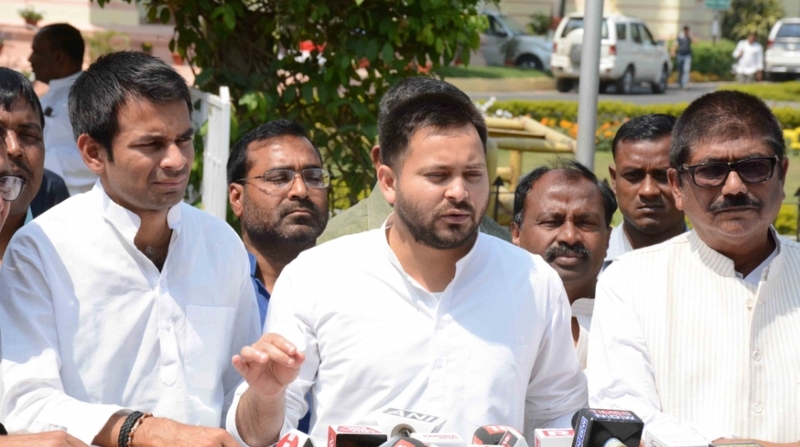 Rashtriya Janata Dal (RJD) leader and former Bihar deputy chief minister Tejashwi Yadav took a jibe at Bihar Chief Minister Nitish Kumar on Sunday, 27 May, on the latter’s comment on demonetisation. In a comment he posted on Twitter, the 28-year-old younger son of RJD chief Lalu Prasad Yadav said that the JD(U) leader has always been slow in understanding the grievances of the people of the state. “He is always years behind in understanding the issues, difficulties & demands of common people. Don’t be surprised if he calls demonetisation the biggest scam of India,” concluded Yadav. Our beloved Nitish Chacha took another sharp U-turn.. He is always years behind in understanding the issues, difficulties & demands of common people. But Kumar criticised the banks for failing to implement the move made by Prime Minister Narendra Modi on 8 November 2016 which took the country by surprise. “Banks are so strict in recovering amounts lent to small-scale borrowers. Why the same strictness is not shown in the case of big defaulters?” he wondered. “I had supported note ban. But because of the role played by banks, people could not be benefited to the extent they should have. People deposited huge amounts in scrapped currency and the money was laundered,” he said on the day the Centre marked the fourth anniversary of the Modi government. Kumar, the JD(U) national president, had come out in support of the demonetisation measure when he was the Chief Minister of the state in the Grand Alliance government comprising the RJD and the Congress. In 2017, he broke off from the Mahagathbandhan and joined hands with BJP to form the government in the state. Deputy Chief Minister Sushil Kumar Modi, however, dismissed suggestions that Kumar’s comments was tantamount to saying that demonetisation had failed in achieving its objective. “That is a completely wrong interpretation. The chief minister did not say that demonetisation has failed. Rather he said that the role of some of the bankers was not right during its implementation phase… there had been reports of irregular deposits of demonetised currency in banks,” Sushil Modi said.